A slight lull happens in the space between the two big openers of November this week, as one major release and two middle level releases tackle the market this weekend. Shallow Hal is the biggest film to reach the market and I promise that'll be the last pun relating to this movie I make. It's another taboo-breaking film from the Farrelly Brothers, although this time they find themselves in a tougher market for their product. Their two films since the surprise success of There's Something About Mary have met with resistance. Me, Myself and Irene opened to $24 million, but faded quickly, ending with $90 million. Even at that, much more was expected from a reteaming of the Farrellys and Jim Carrey. This fall's Osmosis Jones (they directed the live action components) was met almost with outright hostility, opening to only $5.3 million. Their two side productions in that time, Outside Providence and Say it Isn't So also crashed and burned. Not a great track record. I think this goes to illustrate the precarious purchase that this brand of comedy sits on; the line between funny and not funny is fine indeed. In this case, the Farrelly's seem to have found their mark; the ads, while not as side splitting as the original trailer for There's Something About Mary definitely have comic edge to them, even if they're not particularly subtle. Many of the jokes take on that "I don't want to laugh, but I just have to" bent, particularly the 'big splash' scene, for which I've caught more than one person laughing then quickly hiding their snicker under an inverted look. Jack Black and Gwneyth Paltrow are two non-obvious choices to cast in the lead of a film opening in 2,774 venues, as Black has never been the lead attraction for a major film yet and Gwyneth's films have been mostly smaller affairs with a couple of breakouts. Of course, this is pretty much the exact approach of There's Something About Mary, and Jack Black could bring the right level of manic comedy to this. Despite the trouble that Farrelly's have had in recent years, this looks like the right combination for a comeback. A good weekend for it would be in the area of $15 million. The legs of this film will be interesting to watch to see whether this could mean $60 or $100 million for a total. Gene Hackman heads the cast of the succinctly named Heist, David Mamet's latest, which resembles nothing so much as a lower rent, if not necessarily lower quality (remains to be seen, of course) version of this summer's The Score. With a supporting cast of Danny DeVito, Sam Rockwell, Delroy Lindo and Mamet's wife Rebecca Pidgeon (easiest way to get steady work in Hollywood? Marry David Mamet), it reads like a who's who of actors with "character." That may not be enough to get patrons into the theaters, and Warner Bros. seems to recognize that fact, launching this film in 1,891 venues. The Score made $19 million opening weekend this July while Mamet's last film never opened quite wide (State and Main, $1.7 million in 459 venues). A major difference here in the comparison is that while The Score seemed to advertise something resembling slam bang action, Heist seems to be showing off more of the typical Mamet wordplay. This, coupled with the lower wattage stars means that Heist should end up lifting $6-7 million out of pockets this weekend, a respectable, if not outstanding showing. Kevin Kline is the lead man for Life as a House, which expands to 1,288 venues from 88 this weekend. Its $584,000 take in those venues gives a per venue average of about $6,600, a healthy although not outstanding sign of box office to come. The rule of thumb tends to be that a drop of two thirds in the per venue average occurs on every major expansion, which would give about a $3 million total for the weekend. A secondary attraction has been speculated here, with this the first major film with Hayden Christensen, the new Anakin Skywalker, since the announcement of his role. I don't think this will mean much; it hasn't seemed to help Natalie Portman. 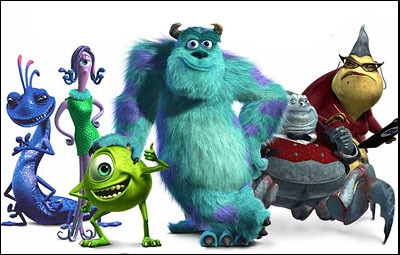 Handily taking first place again this weekend will be Monsters, Inc., which took in a truly monstrous $62.5 million last weekend. Word of mouth to the film has been great to excellent, also garnering massive critical support with a 96% positive rating at Rotten Tomatoes. The only question is whether a film that opens this large can keep that audience for the next weekend. I think that it will be possible and about a $40 million dollar weekend in store for Sully and crew. This should put it at about $116-120 million at the end of two weeks. Jet Li's The One will have trouble hanging on to its second place spot as reception for the film has been middling at best. His two previous films have also had problems with sustaining legs, both ending up under three times the opening weekend for final box office. A severe 50% drop could happen, taking it down to $9.5 million. Domestic Disturbance also looks to be headed for a steep drop, with few holding up its banner. Luckily for it, it doesn't belong to a genre noted for steep drops, so 45% will probably be the extent of it.